Information on St. Ambrose and ideas to celebrate his feast. St. Ambrose is also known as the "Honey-Tongued Doctor," a pun on the saint's name (the word for honey in Latin is ambrosia); his preaching was said to be mellifluous, as sweet as flowing honey. Also according to legend, when Ambrose was a baby, a swarm of bees settled on his mouth, an omen that he would be a great orator. St. Ambrose is the patron of bee keepers, bees, candlemakers, domestic animals, learning, Milan Italy, and students. He is often depicted with a beehive or bees in his iconography, symbols which also indicate wisdom. 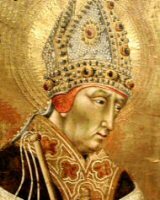 On May 7, Milan celebrates the feast of its patron, Sant' Ambrogio. Young boys and girls bring donations in the morning to the Basilica of Saint Ambrose and lay them on an altar decorated with dozens of flower displays. This brings thousands of visitors who come for the spirit of the festival and the variety of food offerings. Since he is also the patron of candlemakers, it would be fun to try one's hand at making candles. There are a variety of ways, including rolled wax candles, dipped candles and poured candles. One can purchase candle-making kits and materials at the local craft store. To prepare for Christmas, make a Christ candle . For more detailed directions on how to make candles, see Candles 101.